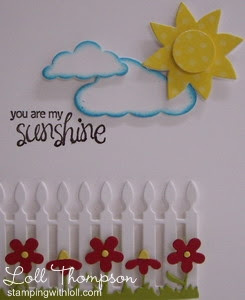 ... and also for this week's SCS Ways To Use It Challenge (WT427 - may flowers). I love these bright red flowers with the yellow centers. Not too much stamping with this card - just the sentiment. Mostly dies and I layered them all so they are two or three layers thick to give them more strength and presence. Hope you like. I popped up the fence, small cloud, sun and center of the sun for added dimension. Cute and Clean and Simple! What a happy card Loll. Just sitting having my first cuppa and you've started my day off wonderfully! Great card. One that really would brighten up your day if you received it. Love it! Adorable and easy scene Loll, love it!! Wish I could just sit down and these ideas would pop out of my head, or I will think of something and I have to scrounge to find stuff, that is what I am working on now, organization, will see if It helps, will take me all weekend to put my room back together, my daughter and I worked all day cleaning stuff out, so hopefully next week I can get down to being creative!! What a lovely garden scene! Love those tiny red flowers with the yellow center and the bright sun! A really uplifting card! Loll, this is adorable and just a perfect use of the colors! Thanks so much for joining us for the Color Throwdown this week! Ooooh, I looove this, Loll...such a sweet little scene!!! Thanks for playing along with us at the Color Throwdown Cahllenge!! !